When reform-minded movements have a limited set of reforms on their agenda, the question arises: what happens when those reforms are achieved? In the case of single-issue reformers the answer is usually not much. Having achieved the reform they were after — responsible government — some of the Reformers turned out to be quite conservative. For some, clearly, responsible government was a panacea, a cure-all, the key to better and more effective government and the endgame. For others, it meant pushing aside the existing Family Compact/Château Clique elites so that the Reformers could have their own turn at the trough of power and privilege. For still others, it was a first step along a path of more extensive changes to the political structure and culture of British North America. Kingston was the seat of government until 1843, when it was moved to Montreal. This would prove to be a fateful decision. It took several more years — and a few other locations — before Ottawa was finally settled on as the capital. The achievement of responsible government in 1848 primed the Tories in the assembly to be outraged by the power now in the hands of their Canadien rivals and the Reformers from Upper Canada. They were further enraged by the passing of the Rebellion Losses Bill, which proposed to compensate financially those whose property was destroyed or damaged by British troops during the suppression of the Lower Canada rebellions. LaFontaine’s bill was based on a report accepted by the government nearly three years earlier, and his aim was to defuse growing radical support for the Papineau wing of the Reform movement in Canada East. At the same time, the bill was a clear demonstration of the power now at the disposal of a block of Canadien votes in the assembly. Lord Elgin (1811-1863), the governor, signed the bill into law on April 25, 1849, and two days of rioting began. 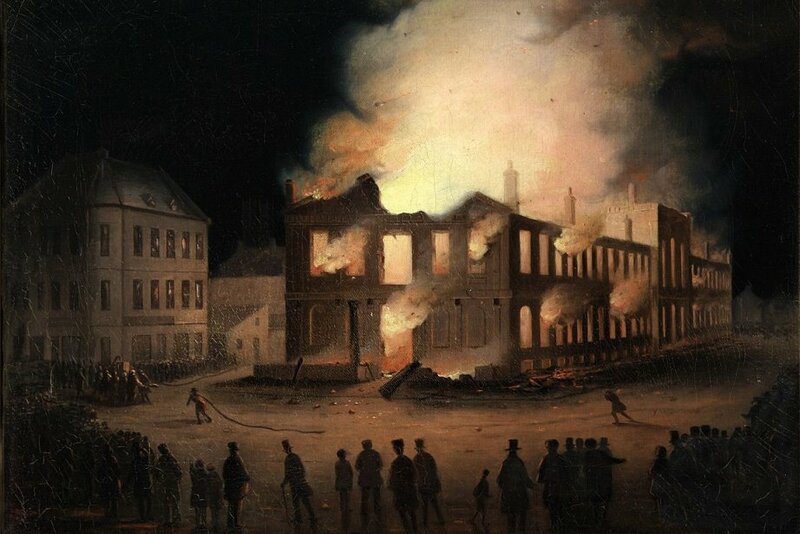 Elgin’s carriage and home were attacked and windows were smashed at the homes of Reformers from Canada East and Canada West as thousands of Anglo-Montrealers took to the streets. The Parliament Building in Montreal was torched and completely gutted. The whole of the libraries from both Upper and Lower Canada had only recently been gathered there and now they were reduced to ashes. Figure 11.10 Burning of the Parliament in Montreal, a painting attributed to Joseph Légaré, ca. 1849. If the only significance of the Montreal riot had been the burning of the Parliament Building, it would have been enough. But what the Rebellion Losses crisis flushed out was the negotiable loyality of “Loyalists.” The Montreal Gazette was especially hostile to the bill and called for Elgin’s dismissal, recall, or overthrow. There was a great deal of talk among the Tories of abandoning the British connection altogether. John Redpath, who built a fortune around canal construction, the industrialization of Lachine, and shipping (though not yet sugar), was among the wealthy Mount Royal Tories calling for a break with Britain. In his case — and probably in others — his Scottish roots made a difference: his affection for the English ruling class was muted and he was genuinely unimpressed by the way Britain treated the colonies. The local elite’s loss of influence in government and the decision to compensate people they regarded as enemies of the state and the Crown pushed the colony’s wealthiest cohort into an unusual stance: some began calling for a new association with the United States. The Montreal Annexation Manifesto appeared in the autumn of 1849, signed by more than 300 blue-ribbon entrepreneurs in the city; subsequently — and ironically — it was endorsed by Papineau and his followers. For the first time there was in the Canadas a declared and open movement in favour of secession from Britain and union with the United States. The response was to move the seat of government away from potentially disloyal Montreal. For the next decade, it was shuttled between Quebec City and Toronto, but that proved to be an unworkable solution. In 1857 it was decided to make Ottawa (until 1855 known as Bytown) the new and permanent capital of the province. The reasons for this choice say a great deal about the concerns of the day: Ottawa was small enough to be managed and/or policed; it was fractious and even rowdy, but arguably less explosive than Montreal; it was defensible against an American attack, given that it was farther upstream and north of the border, and there was a resident regiment and a military canal that could speed reinforcements along if necessary; and it was the only community of any size located on or near the boundary between Canada West and Canada East. Kingston was disappointed. A hotbed of Loyalism and the constituency of Conservative Party leader John A. Macdonald, it was, however, even more exposed to potential American attacks than Montreal. The more hardline Reform element in Toronto made demands for the right to host the colonial administration but this option was, predictably, unacceptable to everyone in Canada East from Montreal down the St. Lawrence. And, of course, Kingstonians objected to it as well. The final candidate was Quebec City: fortified, facing the Atlantic, close to the rest of British North American, and the seat of government for Canada since Tadoussac ceased to be the leading trading post in New France. This option fell afoul of the numbers: the bulk of the population of the province was now much farther inland. As the 1850s opened, it became clear that the population of Canada West was outstripping Canada East. The former had doubled from about 400,000 in 1840 to more that 950,000 in 1851; Canada East had gone from an estimated 717,000 to just 890,261. Anglophone politicians in the western half of the colony who formerly didn’t pay any attention to these figures began a long agitation for representation by population. If the campaign succeeded, the bulk of the colony’s legislators would come from Canada West. More than that, they would be mainly from southern Canada West, in a triangle marked roughly by Hamilton, Windsor, and Georgian Bay. As capitals go, Quebec City was too remote (and too French and too Catholic) for Upper Canadian tastes. If not Toronto, then certainly not Quebec. The Rebellion Losses Bill generated a lot of heat and it also sheds light on the authentic loyalties of some members of the colonial elite. For all their talk of Loyalism and Toryism, a significant number were prepared to make a break with Britain and join the United States. In a strange reversal of roles, reformers stepped forward as champions of the imperial connection. The relocation of the capital to Ottawa was an act of compromise, but it was also strategic. Incendie Parlement Montreal by Jeangagnon is in the public domain. 11.13 Seats of Government by John Douglas Belshaw is licensed under a Creative Commons Attribution 4.0 International License, except where otherwise noted.